Line-up includ­es 23 artist­es and 22 musici­ans with a revamp­ed house band and guest artist­s. LAHORE: After a winter of upheaval at Coke Studio, the popular musical show is set to return to television screens in September. On Thursday, Coca-Cola unveiled season seven’s lineup featuring 23 artists and 22 musicians. This season’s line-up includes: Abbas Ali Khan, Abida Parveen, Abrarul Haq, Akhtar Chanal Zahri, Asrar, Fariha Parvez, Humera Channa, Javed Bashir, Jawad Ahmed, Jimmy Khan, Komal Rizvi, Meesha Shafi, Momin Durrani, Naseer Shahab, Niazi Brothers, Rahat Fateh Ali Khan, Rahma Ali, Sajjad Ali, Sanam Saeed, Usman Riaz, Ustaad Raees Khan, Ustaad Tafu Khan, Zoe Viccaji and Zoheb Hasan. Humera Channa and Jawad Ahmed along with Zoheb Hasan will be making their first appearance on the show. There are a raft of changes for season seven. Among them is a revamped house band for this season. The line-up includes: Aahad Nayani on drums, Babar Ali Khanna on dhol, Imran Akhoond on guitars, Jaffer Ali Zaidi on keyboard, Khalid Khan on bass, Sikandar Mufti on percussions. Momin Durrani, Rachel Viccaji and Sara Haider will accompany them on backing vocals. Jaffer Zaidi and Sikander Mufti have retained their place in the studio and their combination may remind us of the signature Coke Studio sound. In addition to the long line of featured artistes, Coke Studio season seven will also feature a diverse range of guest musicians. They will collaborate with the featured artists and the Coke Studio house band to create a new dimension to this season’s performances with their signature sound. Coke Studio season seven’s guest musicians include: Aamir Zaki, Adeel Bukhari, Arsalan Rabbani, Faraz Anwar, Ghulam Abbas, Hamza Jafri, Jaffer Hussain, Javed Iqbal, Kaleem Khan, Mubashir Admani, Omran Shafique, Sajid Ali, Saleem Khan, Shallum Xavier, Tanweer Hussain and Umer Daraz. Season seven will be produced by Strings duo Bilal Maqsood and Faisal Kapadia. Last season’s experiment with international artistes, that culminated in the departure of long time producer Rohail Hayat, is also being abandoned in favour of a ‘return to roots’ with a wholly local lineup. Coca-Cola Pakistan’s General Manager Rizwan Khan said that their aim was to “reinvent the way music can capture the spirit of Pakistan. Coke Studio season seven will discover the talent and variance that this nation has to offer. Coke Studio has enabled and empowered Pakistani musicians to express their talents and skills. Many new stars have emerged and the initiative has provided a unique platform for the fusion and learning of music”. 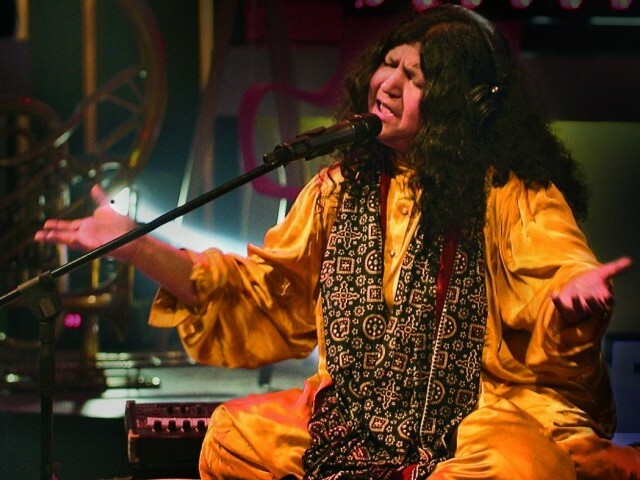 Ranging from traditional Eastern, Modern Western and regionally inspired pop, rock, sufi, folk and qawalli music, this season pays homage to the ‘Sound of the Nation.’ Of particular interest would be how this season will touch upon the role that film music has played in defining Pakistan’s musical history, so Coke Studio’s rendition of Pakistani film music can be expected. Here is the list of the new House Band members, guest musicians and some featuring artistes to look forward to. Thomas Burkhalter interacts with local musicians to understand the genesis and rich heritage of Pakistani music. Nice. Yes, patriotism always sells; music is only an excuse. Judging by the line-up, this will be another Coke Studio season without a single Pashto song. Pashto is, after all, the second most-spoken language of Pakistan. Is it too hard for you guys to do your research and write the name of the band correctly. Its NASEER & SHAHAB and not Naseer Shahab. @yellow: Nescafe basement is entirely a different platform. It wont be right to compare the both. Guys, there is a error in the band name, its Naseer & Shahab. This guy Asrar has a hint of Rabbi Shergill in his voice. Really looking forward to his tracks. I can already imagine some gems coming out of this season. Good luck guys! Its “Naseer & Shahab” (https://www.facebook.com/naseerandshahab) … not “Naseer Shahab”. Please fix this. Agreed With Hussain that Nascafe .B is not that kind of but its perfect but this time strings are here And i’m 200% confident no body can beat coke studio till strings are here !!! However, Ahmed Jehanzeb and Mekaal Hasan Band, along with a few other should have been considered too. There are a few artists (mainly vocalists) who could have been avoided – keeping in mind their capabilities, popularity and also the public demand. Selection of artists/vocalists is what would decide the success of this season. Surely, Gumby and other resident musicians would be missed, but its good to know that other musicians are given a chance too. Aahad Niyani – indeed the best choice to cage behind those drums! Best news I’ve heard in weeks, now this is worth doing a “Dharna” over. sorry but Nescafe Basement was never even close to Coke Studio. Nescafe is a very good initiative and some of the music there is very good but CS is way more mature and awesome.